Plenary speaker Cheryl Bridges Johns addresses the participants at School for Leadership Training. Johns, a member of the Wesleyan-Pentecostal faith, spoke about the ongoing work of the Spirit in the world today. Johns preached at Monday evening’s worship service and provided plenary input on Tuesday and Wednesday morning. Johns also suggested why Christians sometimes resist the Holy Spirit. “Pentecost is a festival of deconstruction,” she said “We don’t like to lose our individuality and our ability for control. As in Acts 2, the Holy Spirit causes us to lose control. Part of this loss of control, according to Johns, has to do with speaking in tongues. 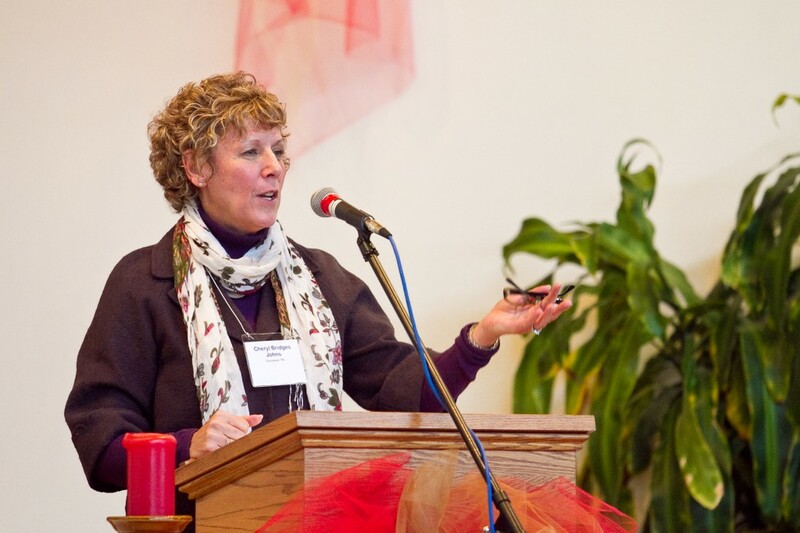 “Cheryl helped us see that removing the Spirit from the world has contributed to a divide between the theological academy and congregational life that can create unedifying categories of ‘educated’ and ‘uneducated,’” said Brian Gumm, a student in the seminary and in the Center for Justice and Peacebuilding. King described how a mentor encouraged him to live without a map, when he was in the midst of a mid-life crisis in his 40’s. “Your maps, your plans for where you’ll go and how, are the essence of responsible functioning. But my mentor encouraged me to give up not only things like plans but even view of self, ways of making sense of life, doctrines locked in as the truth,” said King. Participants selected from a number of workshops focused on the role of the Holy Spirit in topics ranging from theology and biblical interpretation to the work of the Spirit in the visual and performing arts. To order CD’s and DVD’s of School for Leadership Training sessions contact Learning Resources at Eastern Mennonite University at 540-432-4231 or email kingmg@emu.edu.